to help women find joy and success in their lives. A well researched webinar by Dr. Morgan Cutlip to address millenials and their approach to dating and marriage. A great webinar by two psychologists on the subject of purposeful dating with a book that is even better. Research experts give 30 reasons why marriage matters in today's world. Worth reading the full document to see the stats on how important marriage is to society. Mom, you are incredible. If I could provide you with a daily cheer leading team to cheer you on, I would. I think that what you are doing is invaluable, essential and important for you, your family and our society. Your marriage and family are major priorities in your life – probably right at the top of your totem pole. You constantly struggle to give them your best self. However, you are not Super Woman Extraordinaire and cannot just give, give, give till the moon fails. You are only human, can do only so much and have to make sure you have enough gas in your gas tank to get you where you need to go each day. Marriage is a journey together towards oneness and maturity. Strong marriages do not just happen. They are forged in the furnace of life through good times and bad. Love your husband. Really love him. Study how he ticks; learn how he works. Adjust to him and accept him. Join hands together and approach life as one. Make your husband a priority and help him succeed as a father. By making your husband number one in your life, you ensure your continued happiness. Your children will be forever grateful. Motherhood develops the heart and spirit of your children. Be willing to empty yourself to fill them up with strong values, high ideals and good habits. Never give into the temptation that being at home with your children is a waste of your time and talents. Although results may be long in coming, the future of your children depends on YOU. What you fill their minds and hearts with underpins what they live out in their lives. It has little to do with how much you give them. It has everything to do with how you form them. Your time with them slips quickly through your fingers. Maybe you can’t give them a high standard of living, but realize you can do much better. Give them a high standard of life. Wrap them in your affection. Understand them. Demand their best effort.Live your moments with them to the fullest. When you think of your home, what comes to mind? Probably messes to be cleaned, laundry to be washed and meals to be prepared. That’s true, but home is so much more. Home is where the heart is. Home is where warm memories are made. Home is where you are loved for who you are, not what you do or how well you perform. Your actual home and how it is set up are external expressions of who you are and what you value. This is shown in the attention you give to physical details, atmosphere, tone, and personal warmth. We all need great ideas and timeless wisdom to be our best selves. Here is a list of resources to point you in some awesome directions. I have found that 95% of the content is fantastic and so worth the time. Once in a blue moon though there are some bits and pieces I don’t personally agree with. Nevertheless I strongly recommend these resources to inspire, uplift and support you in your great adventures. If you have some exceptional resources to share, let me know. We all need a boost for our batteries and appreciate a great charge. 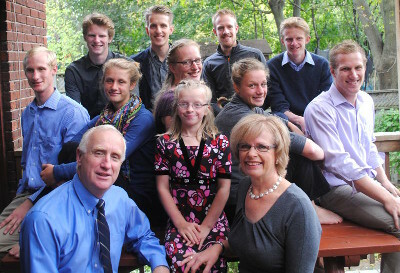 When Irene got married in 1985 to her husband, she never dreamed she would actually have a large family. With no babysitting experience and not knowing how to cook, the learning curve was steep as each child came along. Tapping into great friends and excellent resources, she went on to have 10 children (6 boys and 4 girls)within 16 years. She used her training as a social worker to invest in her family and ripple out to many others. Crying, laughing, struggling and enjoying, she has lived a full life with few regrets. This website lends a helping hand and hopes to inspire many to become the best version of themselves. Enjoy.